Finally putting this back up, so annoyed that I lost it, oh well here we go! This time it’s going to be quicker. 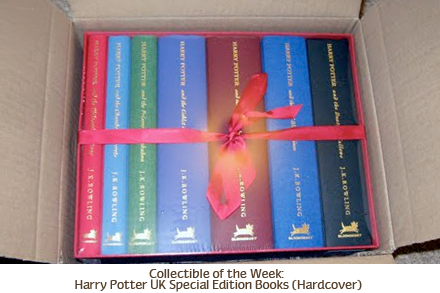 This week we’ve featured that Harry Potter Special Edition UK Boxed set which I just got in the mail last week! About: This set of books is truly a beautiful item, the books come in a red box with a red ribbon wrapped around them. Each book has a cloth cover with a small square where the children’s edition cover is placed. Buy It: Amazon.co.uk is the best place, or you can try eBay but thats more expensive. It’s about $170 right now to get them shipped to the US. BUY THEM! Rating: 10/10 They are VERY expensive but a great buy for true Potter collectors! New Collection Photos – Request Collectible of the Week Segment! Sorry I’ve been neglecting the Collectible of the Week segment, but I just started my first full time job so things have been a bit crazy around here. But it will be back starting this weekend! About: This card was made by Artbox who do trading cards for all different movies. They have normal card sets for each movie and then they have special cards which have pieces of props, costumes and some have autographs. 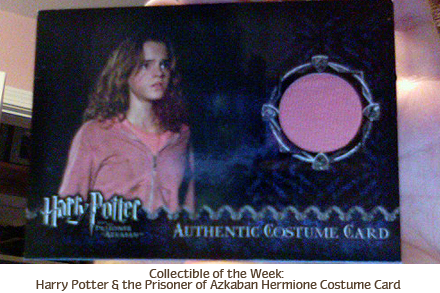 This particular card features Hermione’s pink sweatshirt from Prisoner of Azkaban and it was limited to 450 cards. Value: Since there are only 450 of this card, it is pretty rare and therefore expensive. It goes for a couple hundred dollars on eBay at the most, usually a little under $150. If you want to buy base sets, special cards from current films, or some odd past cards I recommend Rich’s Cards, that is where I buy all my Artbox cards. You can email and ask what special cards he has and he is very good about emailing and has reasonable prices for the cards. Rating: 8.5/10 These pieces are really fun, but they can be a bit pricey for such a small piece of movie memorabilia. 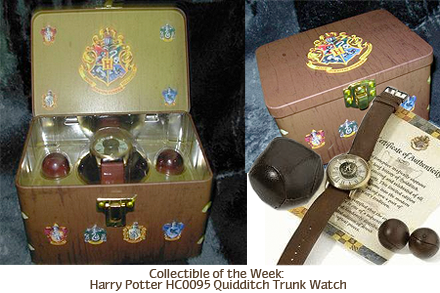 Since WB has just released a new limited edition watch, I found it only fitting to feature a watch for Collectible of the Week, the Harry Potter HC0095 Quidditch Trunk Watch! Buy It: This watch is only available on eBay now, and it is quite pricey, but if you are lucky you might score a deal. Rating: I rate this 10/10! It is a great item & true collectors piece because of it’s rarity. This week we have an item of clothing, that I should never have bought, but I splurged when I graduated high school. 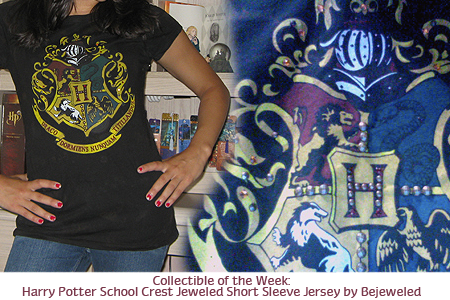 😉 The Harry Potter School Crest Jeweled Short Sleeve Jersey by Bejeweled. About: This t-shirt is a very special item and not many people have it. It may look like a normal Hogwarts Crest T-shirt but actually it is much more than that. Instead of plain black the shirt is black with bits of brown to make it look a bit aged. It also has some brown/tan colored studs (32 to be exact), 13 gold swarovski crystals and 4 red swarovski crystals that have all been hand placed. This shirt is far superior to any other crest shirts in my opinion just because of how the screen-printing looks. The close-up doesn’t do it justice because I had to use my web cam instead of my real camera. Value: The retail price of the item is $79.99, I know, I know I was CRAZY to pay that much for a t-shirt, but I LOVE it and it is still in perfect condition even though I wear it a lot. So it is a good value for the price. But you can still get the normal crest t-shirts and be just as awesome, so not a must buy. Buy it: It used to be available on the WB shop but since it was a limited item it is no longer there. You may be able to find it on ebay. Rating: 8/10 Awesome item, but a bit expensive. This week I’m doing something that everyone needs and can use! 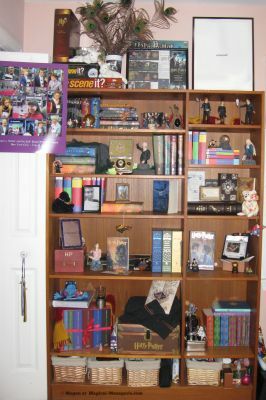 A Harry Potter calendar, this one is the 2010 Desk (or Day by Day) calendar. 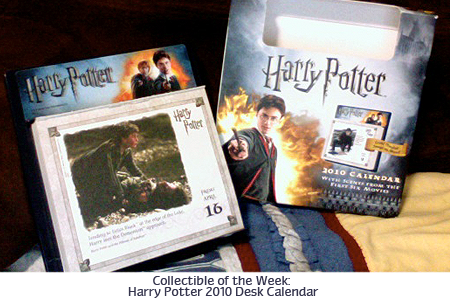 About: The base for this, and the other Potter Desk calendars, is a simple stand and above the calendar there is a “magical image,” basically a moving 3D photo of Ron and Harry with the logo. Each page has a photo from one of the first 6 Potter films, a caption for the photo and the date. They also have designed a fun border to go with the page. They tear off easily and, if you are crazy like me, you can store them in the box the calendar comes in when the day is over. Value: The retail price of the item is $16.99, but you can find it much cheaper now. As we all know, calendars are everywhere, so these aren’t worth very much right now. But I have a feeling that if you keep a calendar from each year in mint condition and have a nice collection of Potter calendars they could be worth something in the future. Rating: 8/10 It’s not too exciting, but everyone can use a calendar!